After visiting between four and five New Zealand wineries a day for three weeks; hop skipping and jumping down the Classic New Zealand Wine Trail; not wearing a watch; driving on the wrong side of the road; and generally having a ball living the life of a world traveler – I’ve faced reality and acknowledge that it’s time to get back to work. Pruning has been underway since December. The Acacia trees have been in bloom since late January. Yesterday the almond trees were blooming in Carneros meaning bud break is just about two weeks off (The Farmer carries around his blue notebook that details first the acacias, then the almonds, next the plums, boom! bud break on grapevines). The cover crop has sprouted and is somehow managing to survive amidst the Carneros Clay Loam. It should be noted that we’ve attempted permanent cover crop before and 2010 may finally prove to be the most successful year yet! Old Vine Pinot Noir loves Carneros Clay – tender blades of clover and fragile grasses do not. While many in Carneros focus solely on water, growing grapes, and weathering the Great Recession in 2010; Thomson Vineyards will instead focus on soil, growing grapes that have a home to go to in September and October, and getting one up on the Great Recession in 2010. Healthy soil contains a diversity of organisms. Major microorganisms include algae, protozoa, fungi, actinomycetes, cyan bacteria, and other bacteria. Pure Biological Systems has created a soil conditioner that supplies the soil with a proprietary combination of critical enzymes, bio-surfactants, bio-stimulants, bio-nutrients, biologicals and fungal stimulants. We will take a look at LH Organics products next week and see about adding some nutrients to the soil to better support the already healthy vines and give the superior fruit quality added punch. For small vineyards netting may be the only option that provides an adequate level of protection. The main problem with netting is the cost. There are several types of bird net systems each of which has its own advantages and disadvantages. Multi row netting uses less netting than single row systems, making it cheaper and relatively quick to put out. Disadvantages are that it requires specialized equipment to apply and spraying is not as feasible once nets have been applied. 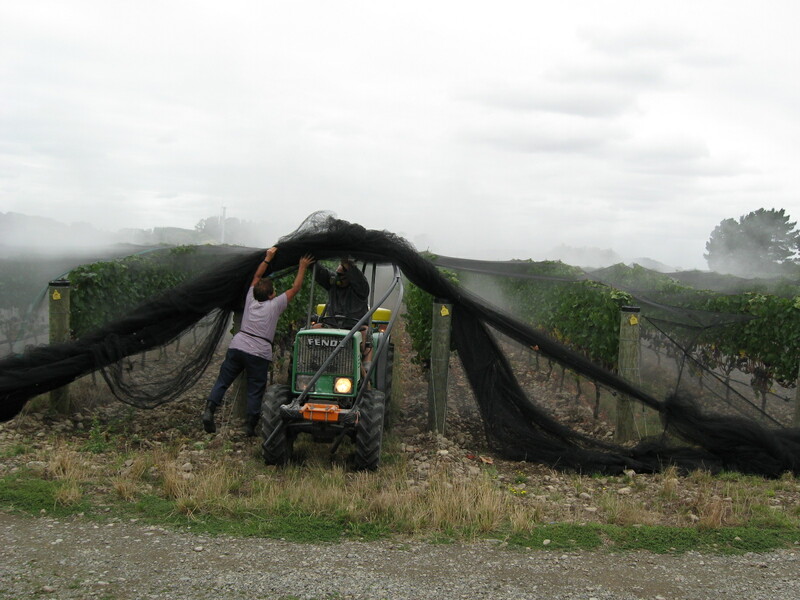 Many vineyard managers told us that Kiwi ingenuity allows them to run small tractors underneath the netting when absolutely necessary. Thomson Vineyards uses squawkers, cannons and other means to deter birds and has seen limited bird damage in its fruit over the past several years. A stretch for any farmer to manage this kind of a crew, but it’s an accepted practice by the Kiwis. Since sheep outnumber people in New Zealand it also makes labor affordable and often more dependable. 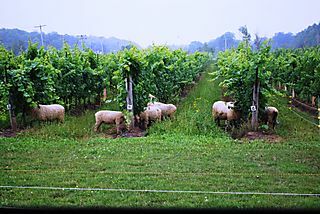 As I was motoring back to San Francisco from Napa yesterday, I saw sheep in Cline Cellars vineyards mowing grass – not leaf “plucking”. Thomson Vineyards has no plans to shepherd sheep through the Pinot Noir, Chardonnay or Merlot this year; it will be challenge enough to shepherd The Farmer, crew, and a gaggle of winemakers through and ensure everyone is just as happy as the next!